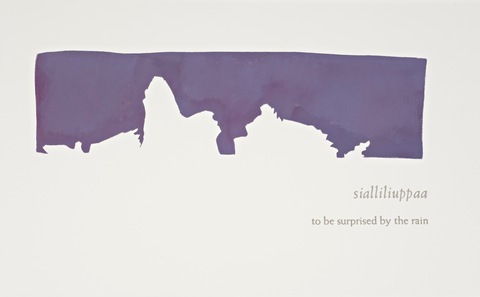 In early 2010, poet and letterpress artist Nancy Campbell spent two months as a writer in residence at Greenland’s Upernavik Museum. 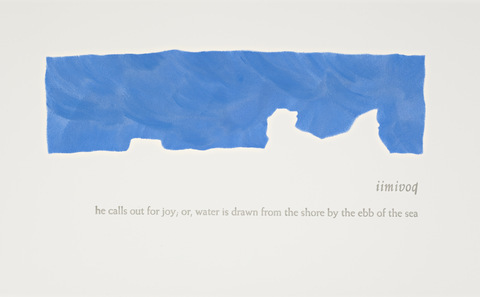 She worked at a window overlooking a harbour and its subtly changing panorama of floating ice. 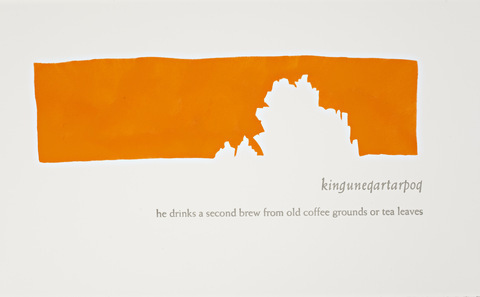 Raised in the Scottish Borders, Campbell had long been drawn to northern climates and originally came to Greenland to write about ice. She found herself paying closer attention to the way the glaciers shaped words and lives of the people who lived among them. 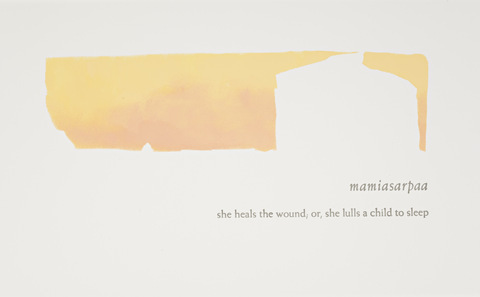 The museum director introduced her to the Greenlandic language, a lexicon of sprawling compound words that contain a multitude of meanings. “Rather than the ice – this cold, other thing – I got fascinated by the way people were interacting with their environment, their sensitivity and attention to it, and the fact that it was a highly sustainable form of life,” she said. 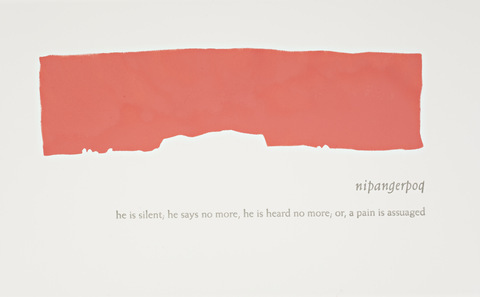 The result of this project is How to Say ‘I Love You’ in Greenlandic, a book that pays tribute to Greenland’s disappearing ice and language. Greenland, an autonomous region of Denmark, is a cold, solid presence in the southern Arctic Ocean. Ice covers the land in a mile-thick, rock-hard sheet. Yet much is slipping away on the island, faster than the inhabitants of the world’s most sparsely populated country can keep up. In July, NASA’s satellite images found that 97% of Greenland’s ice surface had thawed by July 12, a rate of melting so shocking that scientists initially thought they were misreading the data. Scientists from the City College of New York soon determined that Greenland’s ice is melting at the fastest rate since records began. The speed of the melt is changing the relationship between indigenous Greenlanders and the ice upon which they have lived for generations, to the point where they can no longer trust the ground beneath their feet. Two men fell through an unexpectedly weak patch of ice and died during Campbell’s residency, an increasingly common cause of death. Other Greenlanders have had to shoot their dogs because the ice is no longer strong enough to support them while they hunt. The language of the island is also disappearing. Greenlandic, an Inuit language, has only some 57,000 living speakers and is classified as endangered by Unesco. Campbell tried to reflect this sense of longing for a passing world in the words she chose to illustrate in How to Say ‘I Love You’. 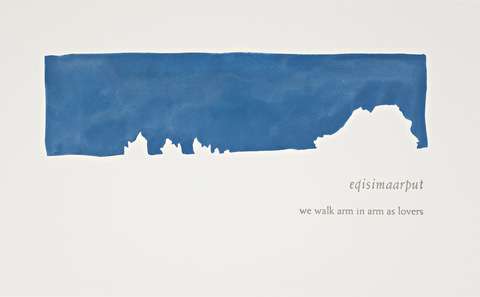 The book is an abecedarium of 12 words, each accompanied by a painting of the glacial landscape. 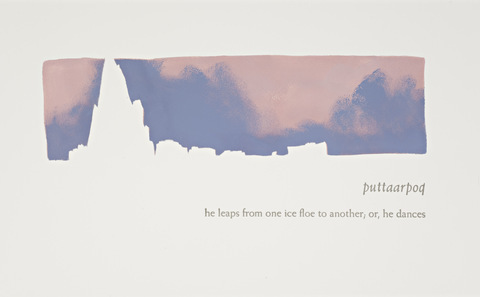 The book forms a prose poem that sketches an abstract love story between two people, and charts the retreat of the landscape’s ice. The compound nature of Greenlandic words allow for multiple interpretations. 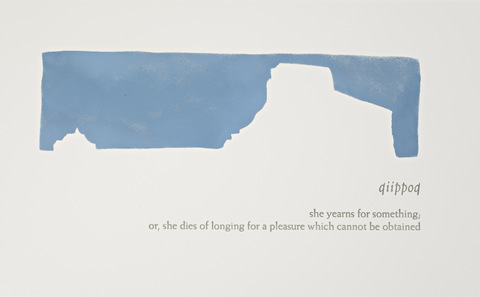 Iimivoq, for example, can mean either “he calls out for joy” or “water is drawn from the shore by the ebb of the sea.” Qiippoq can mean “she yearns for something” or “she dies of longing for a pleasure which cannot be obtained.” Puttaarpoq is “he leaps from one ice floe to the other” or, more simply, “he dances”. 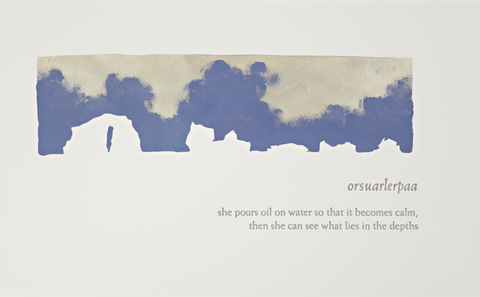 Shortly after she began learning the language, Campbell had a dream in which the Greenlandic language appeared to her as a great and sonorous whale. English words, in the form of tiny fish, flitted around it. 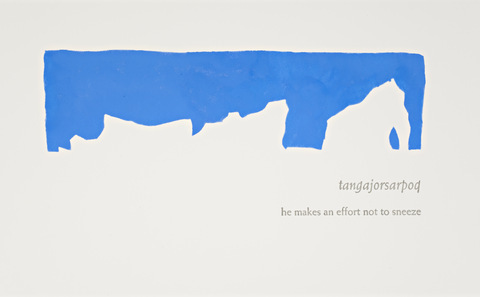 How to Say ‘I Love You’ was published in 2011 with an initial print run of 50 hand-pressed and -painted copies intended for private and institutional collectors. A Belgian publisher will bring out a more affordable trade version for the general public next year. 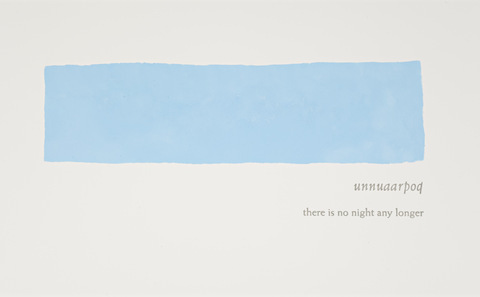 The final word of the book is unnuaarpoq – “there is no night any longer” – accompanied by a painting of a stark landscape devoid of ice. Its solemn finality sounds like a requiem for a world that global warming may no longer allow to exist. 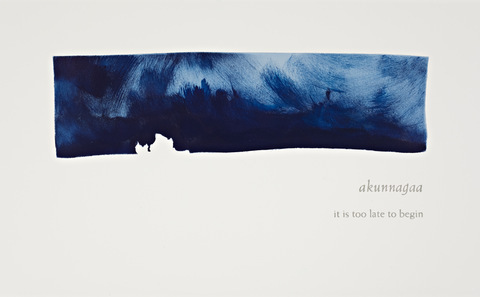 As a counter, Campbell points paradoxically to the first word of the book, akunnagaa – “it is too late to begin”. The best time to begin is NOW! It may be too late to begin, but we will never know until we try. So we must not hesitate one moment longer - we must begin NOW!!! 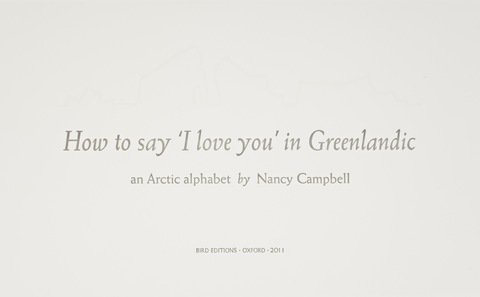 Readers of this article may be interested to know that the featured book "How To Say 'I Love You' In Greenlandic" has been republished as an affordable trade edition in February 2014 by MIEL editions. Bringing Arctic Alphabets to more readers! This article is misleading. The language is not disappearing. There are only 57k speakers because the population of greenland is 57k. An industrial Arctic is coming. Nations hungry for its resources will only aggravate the environmental crisis they have pledged to stop, writes Jenny Johnson.